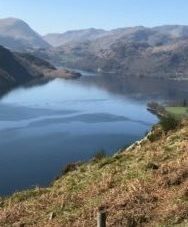 Enjoy magical landscapes in the Ullswater Valley whilst completing the iconic 22 mile Ullswater Way over 2 days, this route was launched by the Lake District National Park on 25 April 2016. Nicola, your guide, was featured on Border News walking this route on the launch day! Enjoy the vibrant greens during Spring in the Ullswater Valley. You will have views into many valleys leading away from Ullswater, towards the south towards the Kirkstone Pass and to the North, Blencathra & the Eden Valley. Your luggage will be taken to your accommodation. Although the walking will not be too strenuous I must highlight that some of the terrain may be technical and I would be happy to discuss this with anyone who may be concerned about the Lakeland Trails around the Lake. Day 1 – Walk north along the northern end of Ullswater around from Aira Force to Sandwick. Accomodation can only be accessed by foot or quad bike! Luxury room price will be en suite under the famous Lowther Barn Café (cheaper accommodation available in a pod on the lake shore, with a short field walk from the main accommodation – something quite special. The pod rooms are quite small (1 is a bunk bed room) but there is cosy sitting room with a woodburner for extra space too. Both accommodation types will be eating in the lovely café where Charlie Sproson of Mountain Run can give you a basic navigation talk in which he will also focus on the following day’s guided walk. Dinner will also be served here – local venison stew using all local ingredients alongside! Day 2 – The walk back to Glenridding and onto Aira Force around the southern tip of Ullswater under the crags of Place Fell with panoramic views of the Helvellyn Massif, and looking up into the valleys of Glencoyne, Glenridding, and Grisedale will complete the Ullswater Way. Standard Room Price from: £ 220 to include All packed lunches provided by Nics Nordic Walks. Deposit is £100, balance payable 4 weeks prior to holiday date. Single Person Supplements will apply, price on application. We can also arrange for the Ullswater Way at a more leisurely pace over 3 days to include a trip on the Ullswater Steamers also. 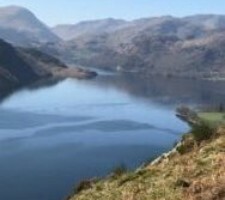 We also offer a Windermere Way Holiday (45 Miles in total) in The Lake District which can be arranged over 4 or 5 days.